B2 Web Studios is excited to have worked with our friends at Miron Construction on a new mobile app and website showcasing Oshkosh Corp.’s recently unveiled global headquarters. 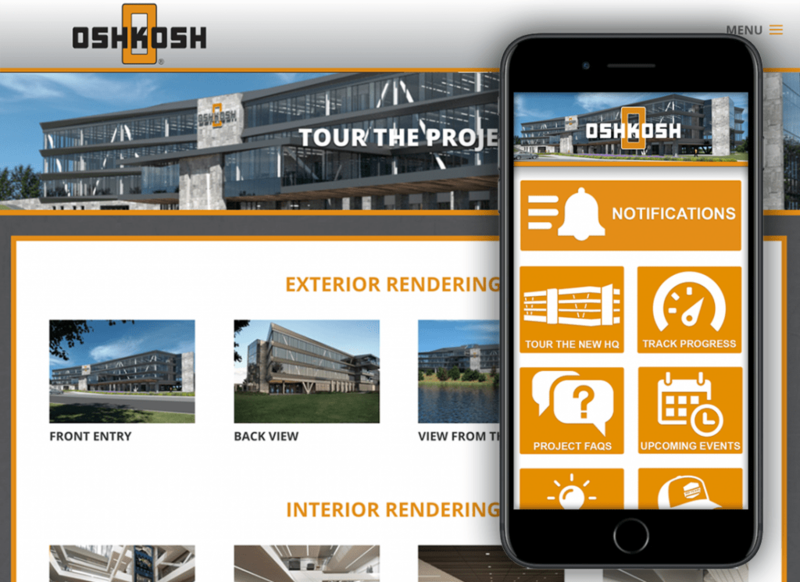 The https://oshkoshhq.com website and downloadable iOS and Android apps provide Oshkosh Corp. employees and the community with a tour of the new facility, and will track the progress of the building project. As the building project progresses through the 2019, this mobile app will be updated to include 3D flyover videos, important news updates, information for Oshkosh Team Members, and even a webcam feed from the construction site! Once the building project is complete, app users be able to receive notifications about important news or upcoming corporate or community events, and more! The new Global Headquarters will help drive Oshkosh Corporation’s People First culture, allow for more efficient operation, help to retain and attract top talent and remain a key contributor in the community.